GRANDE PRAIRIE, AB – Grain Bin Brewing has announced that it will be closing its current location on September 22nd in preparation for a move to a new space elsewhere in Grande Prairie, and it has marked the occasion with a release of a new limited edition beer. Lagered for 2 months, aged for 8 in bourbon barrels, and then bottle conditioned, this beer is almost a year in the making. Finishing at 9.5% and bourbon gold, it has a fruity aroma, complicated vanilla flavour, and a smooth, balanced finish. 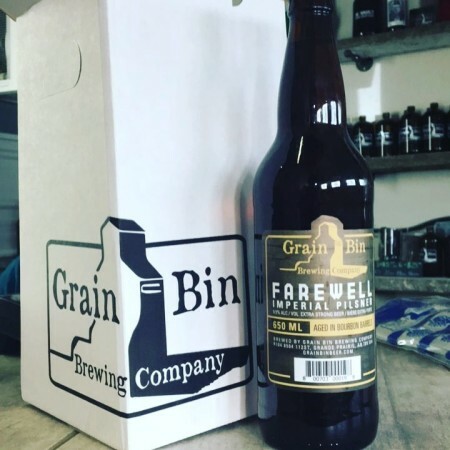 Farewell is available now in the Grain Bin retail store, which will be open from 10:00 AM to 6:00 PM on Monday, Tuesday, Wednesday, and Friday, and 1:00 PM to 9:00 PM on Thursday, for the next two weeks. Details on the new Grain Bin brewery, including its location and expected opening date, have yet to be announced.